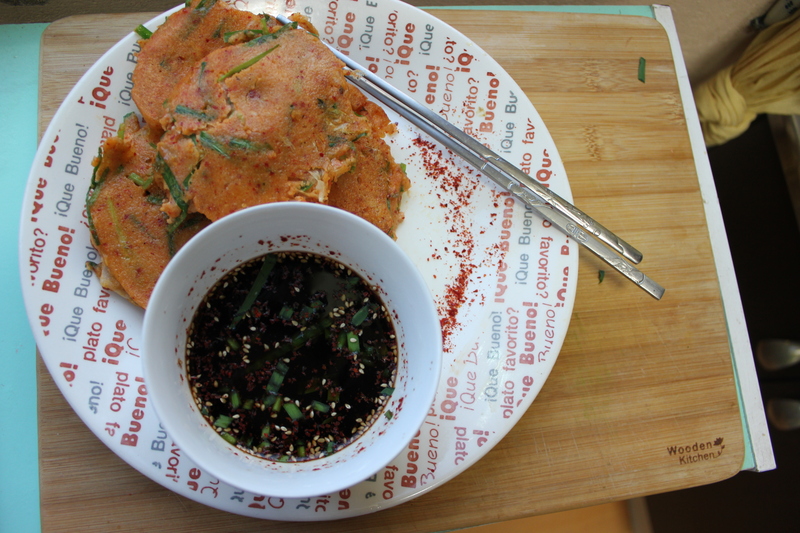 One of the first dishes I tried in Korea was jeon—a savoury stuffed pancake dish native to the peninsula. Though deemed “pancake” by Western eyes, jeon often focuses more on the filling than its glutinous vehicle, with its tasty innards often spilling out the sides. 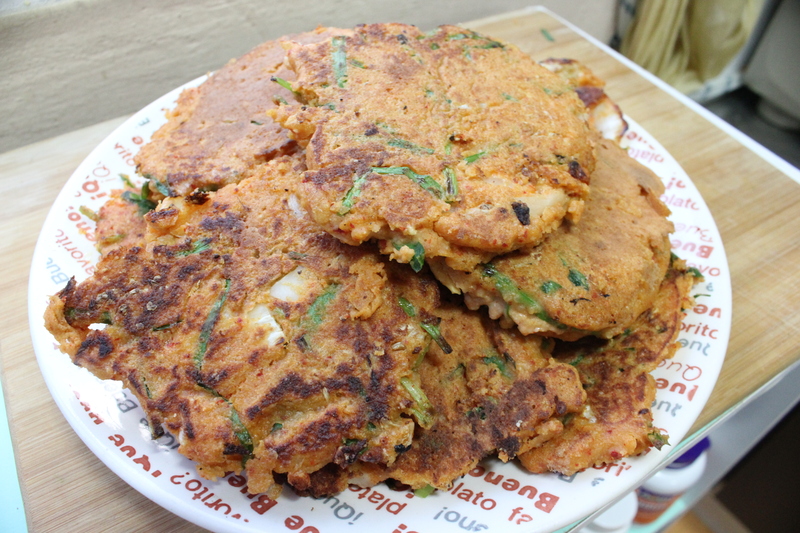 Usually served as banchan, or “side dish”, jeon comes in many forms and flavors—as pajeon, or green onion pancake, saengseonjeon, a variety stuffed with seafood, bindaetteok, made with mung beans and veggies, and many more—but according to my tastebuds (and fervor for anything kimchi), the ace of cakes here is clearly kimchijeon (김치전)—which is, of course, kimchi pancake. 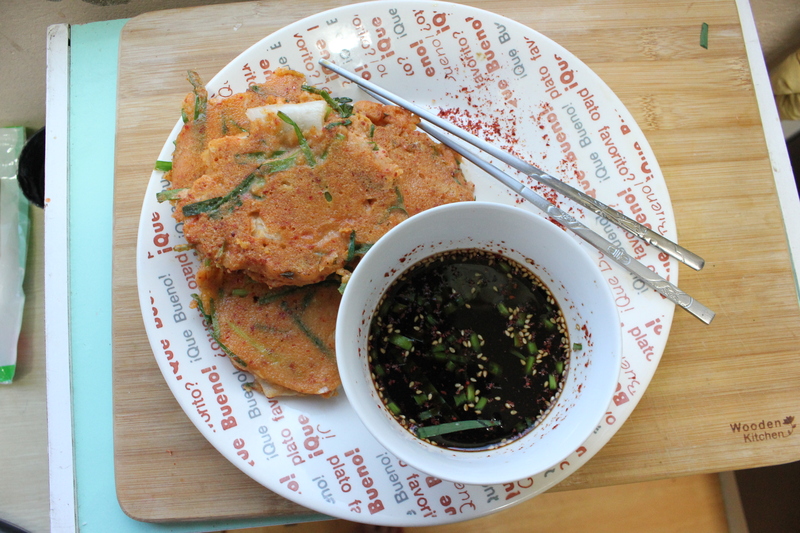 Tinted with that familiar crimson hue so pleasantly ubiquitous in Korean cuisine, kimchijeon takes both the flavor and texture from Korea’s favorite fermented cabbage dish, mellowing its spicy and sour tones with wheat flour and salty dipping sauce. Personally, I like to work wheat-free as often as possible, so it’s only natural I took this traditional recipe and gave it a more tummy-friendly take. In keeping with the Korean theme, this recipe uses homemade brown rice flour (which is faster to make at home than pick up from the shelf at the store, though its easy to find in-store or online) instead of wheat flour, and word from my wonderful taste testers’ mouths is that the gluten was not missed. 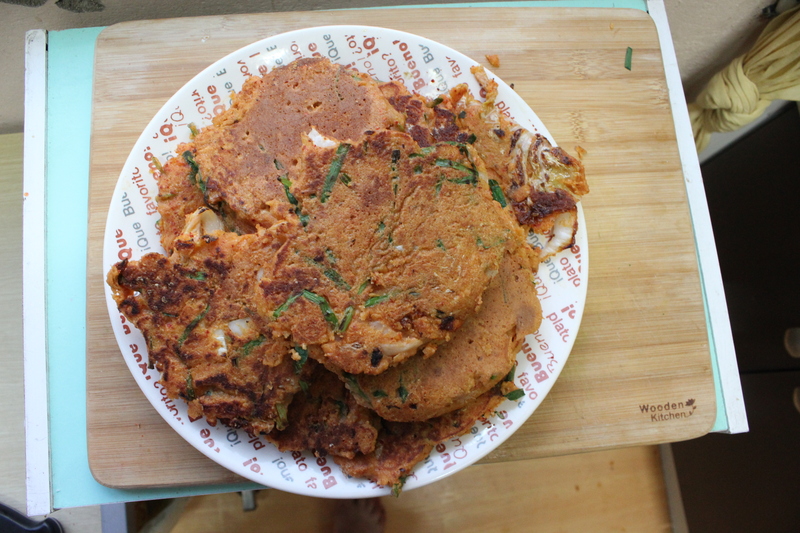 I added some chopped green onion for a little extra kick and also for that familiar pajeon flavour (does anyone else live off of Chinese green onion cakes during Heritage Days?). Rice and kimchi are the ultimate Korean staple—and here, they are reimagined as a tasty break from routine. And this recipe ummm, really takes the cake. 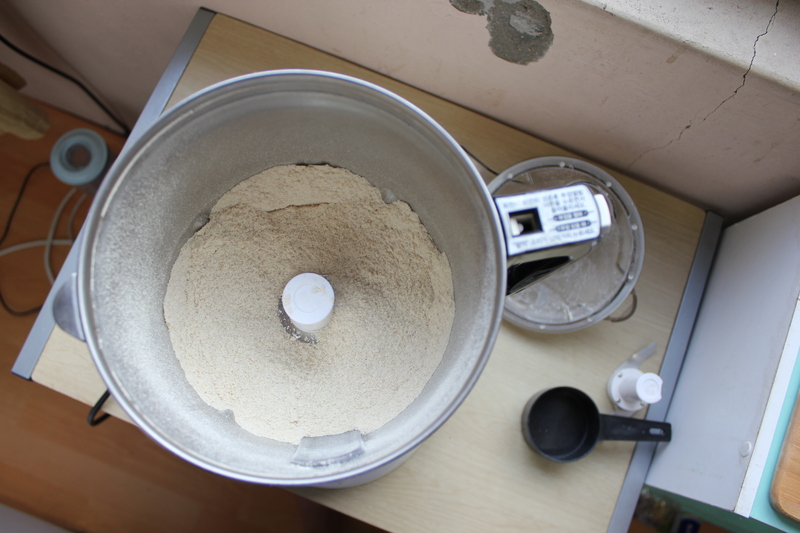 To make the rice flour, you need a food processor or high speed blender (or flour mill, if you have one!). Make sure your equipment is bone-dry. 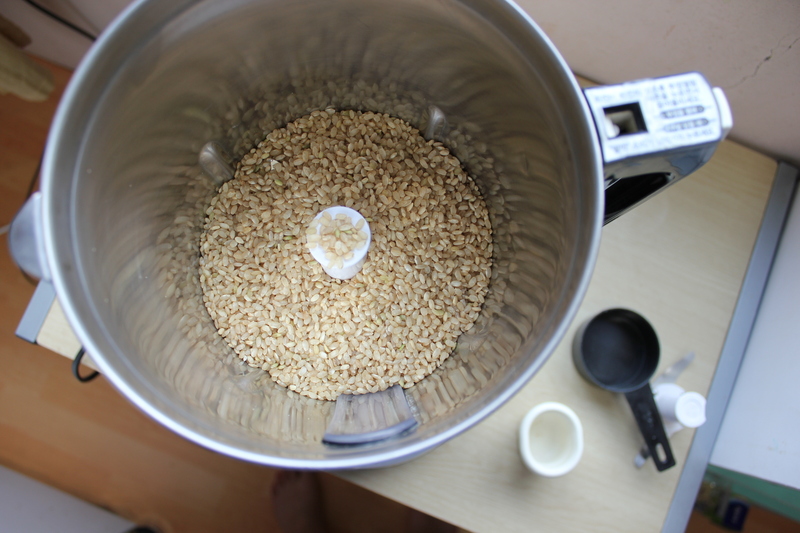 Measure out your rice (do it in small-ish batches, no more than 2 cups at a time) and grind it in your food processor, switching between the “high” and “pulse” setting until you have a very fine grain. According to the very reliable internet, in most food processors or high speed blenders this should take about five minutes, in my crazy jet-engine food processor it took about one. Huzzah! 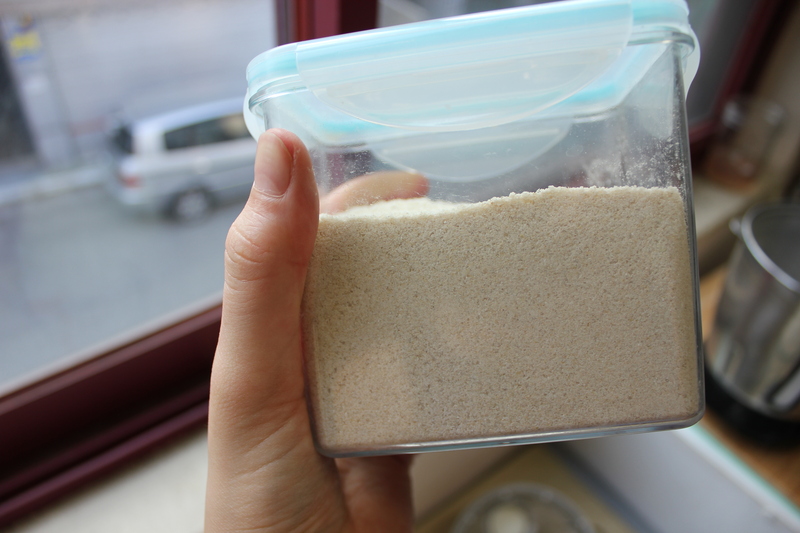 If you don’t use it immediately, store the flour in a tightly-sealed container and keep refrigerated. In a large bowl, combine the flour, starch, and salt. Beat in the eggs and water until combined (note: the batter should be quite thick). 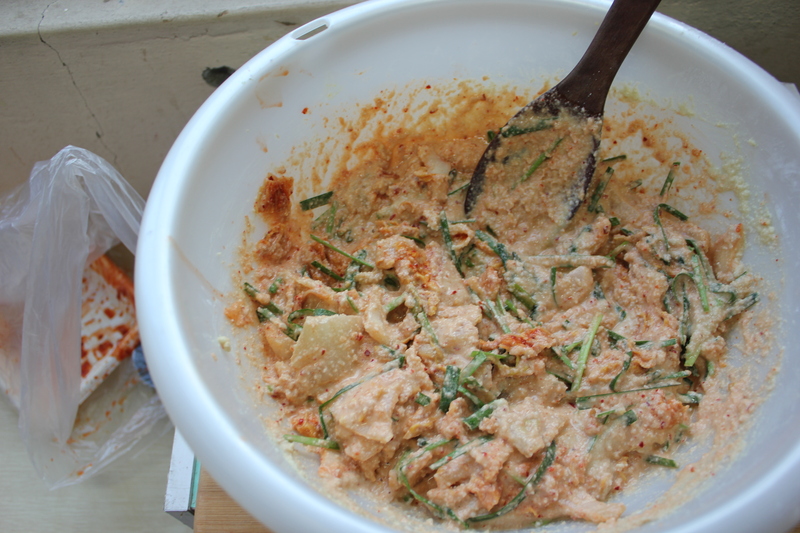 Mix in the chopped kimchi, kimchi “juice”, green onions, and red pepper powder, if desired. In a frying pan over medium heat, heat up the coconut oil. Use a ladle to make round, 3-inch wide pancakes. Flip when golden brown. **Note: Most Korean restaurants will serve a giant, full frying-pan size jeon with scissors for the table to cut and share. If your frying and flipping skills are apt for that, go for it. 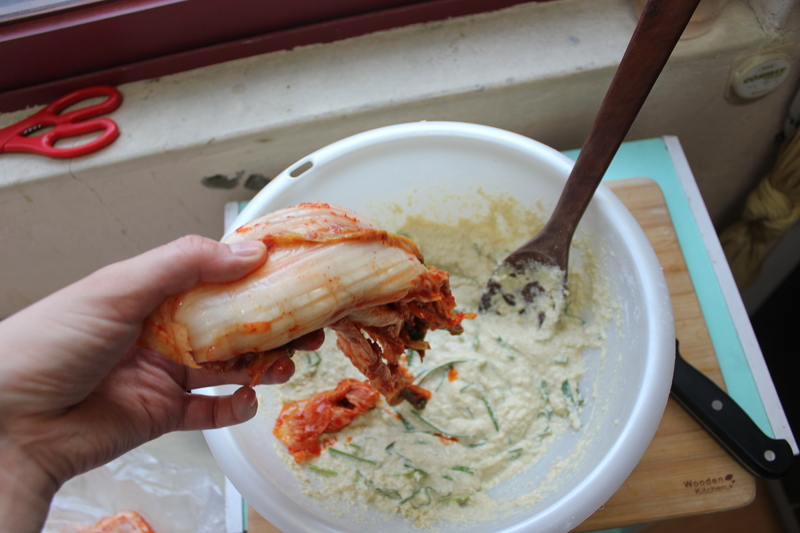 Otherwise scissors, a pizza cutter, or a plain old kitchen knife will help you cut the jeon into easily-servable strips. hi! I'm kass. I left my BFF, kale, back home in Canada for a bit while I search abroad in Korea for new fun food and health hurrahs. Care to join me on my journey? Enter your email to follow Kale and Kass and receive notifications of new posts via email.